The Topographical Map of the County of Kent of 1769 denotes Ewell as ‘Ewell Mannor’ in the ownership of Sir Philip Boteler who also owned the large establishment of Baram (Barham) Place on the north bank of the Medway River at Teston. 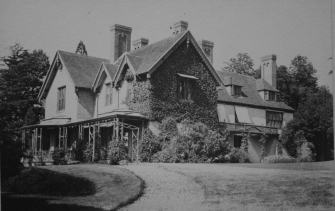 By 1840 Richard Whitehead is the owner of Ewell Manor. An insurance document of that date gives a list of the buildings associated with the house and implies that the house has been rebuilt on the same location, which is backed up by the 1844 Tithe map of that time. The Invicta Kent Fire Insurance Company values the house as twelve hundred pounds along with a ‘barn near, thatched’ (£400), stable and shed (£150), Cattle Shed (£50), Granary (£150), Carthouse (£800) and Storehouse (£300). The estate then passes through the ownership of Lionel Fletcher in 1891 when the census shows he has living with him and his family on the estate; a cook, 2 kitchen maids, parlour maid, gardener, governess, nurse, footman, ladies maid, game keeper, agricultural workers and coachmen plus the latter’s family. Around 1908 there was also a miniature railway installation that could be ridden as it ran through the grounds. This was moved to Torry Hill in Doddington in the 1920s. 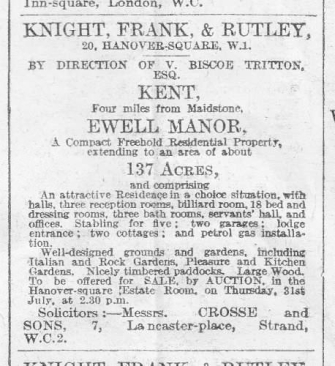 The estate was auctioned in 1919 and an advert was placed in The Times national newspaper on July 17th. It shows the estate totalling 137 acres and now including a petrol pump installation as well. 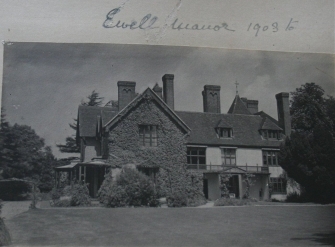 By 1922 Frederick Hoare, a solicitor, was living at Ewell Manor with his family. Their graves are clearly seen at All Saints church in the parish. Soon after Captain Henderson Russell Landale bought Ewell Manor. He commissioned many landscape changes that are reflected in the 1938 Ordinance Survey map, including the terrace beneath the then house, the plateau that was used as their lawn, the rockery at the swimming ponds and a rose garden. There is a plaque to him in the church and also his grave which though now barely legible with time, mentions his wife’s love of her garden. Upon his death, the estate passed to his daughter Agnes Cornwallis (nee Agnes Jean Russell). During her ownership the house was demolished in 1967. It is unknown exactly why but may have been before it was Grade 2 Listed, which came in after WW2. When it was demolished, all materials were sent to East Farleigh reclamation yard and the remnants were bulldozed into the cellar. Upon her death, the estate passed to her heirs who sold the land in lots between 2005 and 2012 including Garden Cottage and The Bothy. Quarry Wood passed to the Woodland Trust. Since 2011, Peter and Cathryn Meddemmen have been the current owners and have rebuilt Ewell Manor for the 21st Century with their son Sebastian. They are in the process of landscaping the gardens so that they can once again be loved.